TR Fastenings (TR), the global specialist in the engineering, manufacture and distribution of industrial fasteners headquartered in Uckfield, is again sponsoring successful Sussex triathlete Jamie Bedwell, who is about to start another busy season as he continues on his quest to reach the Paris Olympics in 2024. Despite a serious car accident in 2016 and health problems in 2017 caused by scar tissue, Jamie has never given up his dream of competing for Great British Team. Jamie gets up to train early in the morning before and after his University commitments whilst he prepares for the 2019 season which will be his second year competing as an U23 competitor in the British series. Still only 20, Jamie began triathlon training at the age of 16 and is now a member of elite club, Bodyworks. In February, Jamie will be joining other squad members at a regional academy training camp in the Algarve, Portugal, for ten days of intensive training in preparation for the season ahead. TR is one of two sponsors Jamie relies on to help with costs towards his training, competition expenses, kit expenses and equipment. Jamie also works part-time with triathlon specialists ‘The Tri Store’ in Eastbourne, and is currently completing his final year at the University of Brighton (Eastbourne campus), where he is studying podiatry. As well as competing at an elite level, Jamie is also determined to use his platform as an athlete to do good, spreading the word about important causes, positive change and taking the opportunity to help others. In September 2019, Jamie will be working with the United Nations on a special campaign aimed to raise awareness of the issue of plastics used in the bike and triathlon industry ending up in our oceans. Jamie hopes to raise awareness of the dangers of using single-use plastics and the need to find alternatives to reduce the industry’s impact on the environment. The 2019 season begins in April with a swim-free ‘Duathlon’, before the British Triathlon series kicks off in June with a key event at Blenheim Palace. Jamie will be competing throughout the season across the UK, with standout races in Cardiff, Llanelli, London and Eastbourne. As well as competing for prize funds, Jamie will also be looking to cement his position as an under 23 athlete, on the pathway to Olympic selection for the 2024 games in Paris and the 2028 games in Los Angeles. The first step will be to qualify for the European Cup, which will mean being within the top 5 of his field. After this, the goal will be the World Cup, the World Series, and hopefully on to the Olympic squad. 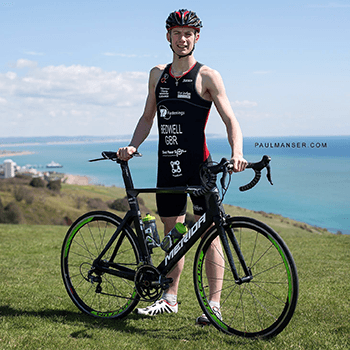 Uckfield based global fastenings manufacturer and distributor, TR fastenings (TR), is once again sponsoring aspiring Sussex triathlete Jamie Bedwell, as he returns to competitive racing after a serious accident. Despite his setbacks, Jamie has made a staggering recovery and is working his very hardest in order to be eligible for selection for Team GB at the 2024 and 2028 Olympics. Jamie, who was hit by a car whilst out running in October 2016, suffered severe injuries to his kidneys, back and head and was admitted to hospital in Brighton. To the amazement of the medical team and his family, Jamie was released after 5 days and was back in the training pool just 4 weeks after the accident. He completed his first run last Christmas and started the 2017 triathlon season in March. Jamie has also just returned back from surgery on his stomach where he underwent removal of scar tissue that had built up in his bowel from last year’s accident as well as the removal of his appendix. Last year’s season finished very successfully for Jamie, where he finished in the top 15 British athletes at the World Championship qualifiers. However, bone pain and stress fractures caused by the accident meant that he narrowly missed out on his place to compete in the European Cup series last summer and was forced to take time out. Jamie re-located to the Alps to undertake altitude training and focus on getting his strength and endurance back to his previous high standards. His triathlon training, which amounts to over 20 hours a week, is progressing well and Jamie will be stepping up to the Olympic distance in the sport next April as an U23. His ultimate aim is still to reach the Olympics and use his popularity in the sport to help create a platform to promote positive change in the world. Jamie has his sights set on the Paris games in 2024 and LA in 2028. TR’s sponsorship will go towards equipment for all aspects of his training, which includes travel expenses, competition expenses, kit expenses, training camps as well as studying at University. As well as TR’s support, he is also signed to triathlon specialists ‘The Tri Store’ in Eastbourne, where he also works part time, and is a member of triathlon club ‘Bodyworks’ which is a UK centre of excellence for the sport. 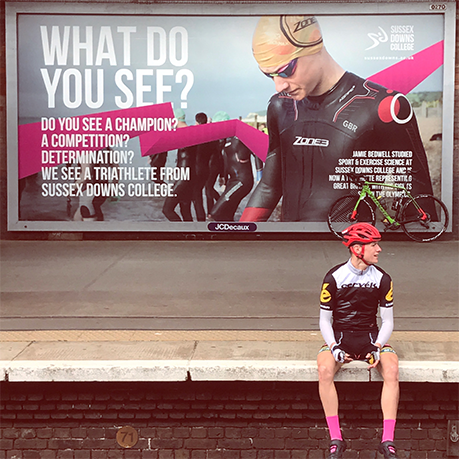 TR Fastenings is delighted to be sponsoring Jamie Bedwell, an aspiring 17-year-old triathlete from Uckfield who hopes to be selected for the Olympic Games in the next ten years. Jamie decided at the age of 14 that he wanted to pursue a career as a triathlete and as a result of around 20 hours a week of training alongside studying for A Levels at Sussex Downs College in Eastbourne, he is now racing for Great Britain in the British Super Series, a group of races that take place all over the UK and hopes to represent Great Britain in the European and World Championships. Scroll down to see the latest updates on Jamie's training. Jamie recently took part in the last race of the 2016 season and as a result has now completed the second of three years in the Great British Elite Junior age category and taken another big step towards achieving his aspirations of competing in the Olympic Games. As one of Jamie’s sponsors, TR Fastenings has followed his progress over the course of the last year with a combination of awe and pride and is delighted to announce that it will continue to sponsor him for the 2017 season. TR recently caught up with Jamie and he shared his reflections on the past few months. "This year has been hugely successful," he comments. "Qualifying for the British Championships and being ranked inside the top 15 GB triathletes, as well as numerous great results including becoming Sussex Junior Time Trial Champion, finishing 2nd behind former world champion Ben Allen at the Eastbourne Triathlon and improving my finishing ranking in the Junior British Super Series. "Whilst for many the start of university means quitting or majorly reducing the number of hours for triathlon training due to having to move away or not having the correct coaching staff at their new university, this year I also gained my funded place to study BSC Hons. Podiatry at the University of Brighton (Eastbourne Campus). This allows me to continue my training at one of the best triathlon setups in the world whilst furthering my education and development as an individual. “I have just completed the national academy trials, which signifies the very end of racing for the season and I will then be taking a few weeks of easy (tapered) training to allow my body chance to recover from a long hard season. I will not be doing any less training; it will just be easier so that my fitness is maintained. “We congratulate Jamie for all he has achieved in the 2016 season and look forward to following his progress in 2017,” comments Geoff Budd, Trifast Director and European Managing Director. Jamie took part in the national age triathlon championships at Leeds Castle on 26 June. The castle grounds and surrounding area provided the perfect triathlon course and Jamie was pleased with his performance. He is now in a heavy training block working towards the British National Elite Championships in Liverpool in August. Watch his triathlon experience here. Many congratulations to Jamie for his superb performance in the Eastbourne Triathlon, which saw him finishing 2nd place in a field of top GB elites and age groupers. Find out more and catch Jamie in action on his Facebook page. Success isn't given, it's earned on the track, on the field, in the gym. With blood, sweat and the occasional tear. Check out this video footage from Tuesday Evenings V02MaxTest. Big thanks to University of Brighton Masters students; Jason Newbery and James Smith. Jamie’s incredible achievement at the recent National Triathlon Trials where he managed to qualify for both the British championships and British series proves it not only takes physical ability but a great deal of mental strength and determination when the chips are down. What a weekend! The national trials are set up in Loughborough each year to rank the athletes in their respective age categories from 1-50. The trials are set up as a split up triathlon, with the swim held in a gala format on the Saturday (800M) and the bike and run on the Sunday, with athletes released into the first transition in the position they finished in the swim. This year I am in my second year in the Junior age category (17-19 years old). The top 15 from each category go on to compete at the British championships, which this year is the qualifier for the World championships held in Mexico. The swim on Saturday was a great start to the event. I had aimed to swim a new PB of 10 minutes for 800M which in what was my first ever swimming gala would have been a good result. In the end I finished the swim in 9.52 minutes which put me in a great position for the Sunday (35th position). When released into transition 1 on Sunday, I fought hard to catch up a large pack that had formed in front of me on the bikes. As a pack we worked efficiently together for the 20.0km duration and managed catch a number of athletes, coming into transition 2 inside the top 20 places. As I came into Transition 2 there was a big bunch of us in a very small space and unfortunately as we entered the front of my wheel hit into the back of someone's pedal, which was enough to send me flying over my handlebars and flat onto my face (the other boy was unaffected). However, I picked myself straight back up, grabbed my shoes and headed out for the 5.0km run, now a long way behind the pack I had previously been with. During the first half a lap I felt very sick and I think in a little bit of shock. I couldn't find any rhythm to run and my legs felt very empty. At the time I just wanted to pull out it would have been very easy to have done and blame it on the crash but I kept going, focusing on trying to catch now the number of athletes in front of me. When it came round the end of lap 1/2 I had now found some rhythm and felt much better but I was still a long distance behind everyone else. I knew I had to give it everything and spent the last lap catching athletes 1 by 1. In a final sprint finished I managed to pull through in 13th position, making at least 7-8 positions on the final lap of the run! Qualifying me for both the British championships and the British series this year. This season's opener got off to a great start for Jamie finishing 9th in the 17-18 age category and 16th overall junior! Only 5 weeks back from an 8 week injury, Jamie is very happy with his performance. Jamie has been cranking up the training with a week at Fuertaventura Training Camp. Check out his video to see the highlights! A great start to the year for Jamie who received the Tim Whitmore Cup for Sporting Excellence Award from Sussex Downs College, presented by the MP for Eastbourne and Willingdon, Caroline Ansell, and sponsored by TR Fastenings. Now it’s back to training ahead of the first race is on April 3rd in Windsor. 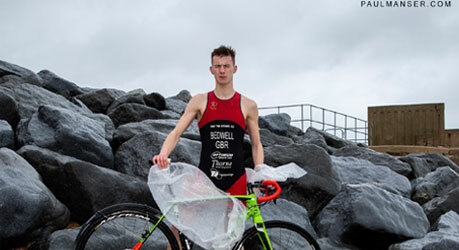 TR Fastenings Supports Uckfield Triathlete with Eyes on the Olympics! Each week Jamie typically clocks up over 9.5km swimming, 150km cycling and 40km running; a grueling training schedule, but one he is wholly committed to.